An NFC clash opens up Week 14 as Tony Romo and the Dallas Cowboys will travel to Chicago to clash with Jay Cutler and the Chicago Bears. With only a few weeks left in the regular season, each and every pick in an office pool is crucial. Get an NFL Pick Em Week 14 sheet for free right here. The sheet is free to download and free to print from Printablebrackets.net. Both the Cowboys and Bears entered the 2014 season after narrowly missing the playoffs a season ago. Both teams suffered losses in their respective regular season finales/de facto division championship games to miss out on the postseason. The Cowboys and Bears also hooked up in primetime in Week 14 last season. Chicago cruised to a 45-28 win over Dallas on “Monday Night Football”. 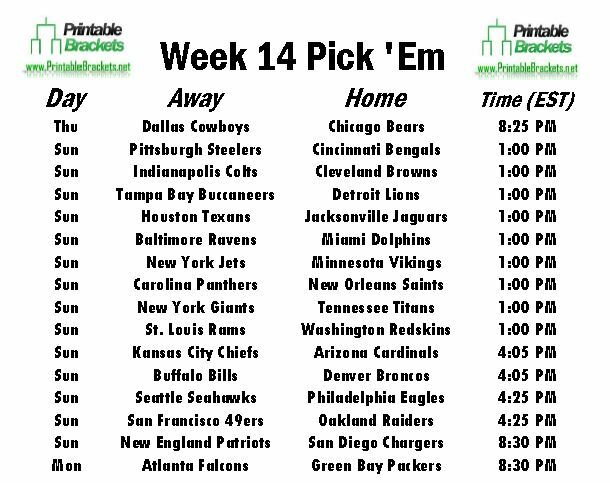 Meanwhile, there are nine early Sunday games on the NFL pick em Week 14 sheets. Some division battle are on tap, as the Pittsburgh Steelers will square off with the Cincinnati Bengals, the Houston Texans will take on the Jacksonville Jaguars, and the Carolina Panthers will collide with the New Orleans Saints. In late Sunday action on the NFL pick em Week 14 sheet, the Seattle Seahawks will be on the road to face the Philadelphia Eagles, while the 49ers and Raiders will renew their Bay-area rivalry in Oakland. Peyton Manning and the Broncos will also battle the Buffalo Bills in Denver, while the Cardinals and Chiefs will clash in the desert. In primetime, Philip Rivers and the San Diego Chargers will host Tom Brady and the New England Patriots on “Sunday Night Football”. The Week 14 schedule wraps up with Aaron Rodgers and the Green Bay Packers welcoming Matt Ryan and the Atlanta Falcons on “Monday Night Football”.